Many users reporting that new Cumulative Update KB3172985 fails to install or stuck midway. Microsoft offers few fixes for this problem. 2. If that doesn’t fix Cumulative Update KB3172985 problem. Simply Download standalone installer and install it by your self. If you have installed earlier updates, only the new fixes that are contained in this package will be downloaded and installed on your computer. 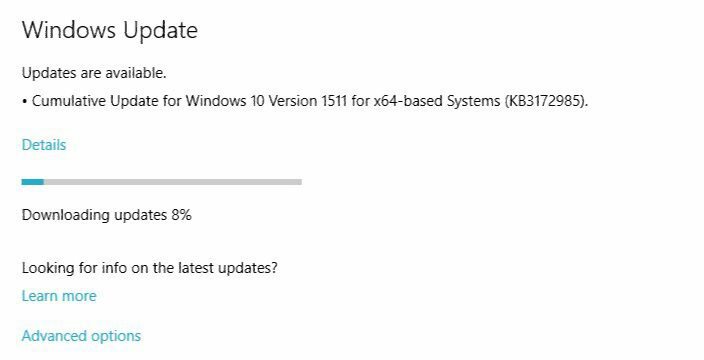 If you are installing a Windows 10 update package for the first time, the Cumulative Update KB3172985 for the x86 version is 501 MB and the package for the x64 version is 914 MB. I had this update failing too. After HOURS of looking for a reason, I finally found it. I went into Disk Manager. The system recovery partition, set to 1GB, had only 64MB free. I right clicked and assigned it a drive letter, went into the drive in file explorer. I found an image file in there and move it to the C:\ drive. I left everything else alone. I remove the assigned drive letter, so no one could get to that drive after this, and re-applied the update. After many, many, many attempts, the update installed!!! I almost couldn’t believe my eyes.